An international team led by Miguel M. Ugeda and Michael F. Crommie has demonstrated the coexistence of superconductivity and charge density wave order in a single layer of NbSe2, a model transition metal dichalcogenide metal. The demonstration that a single layer of NbSe2 is a true 2-D superconductor is a breakthrough in the field of 2-D materials. This work has been recently reported in Nature Physics. Very few 2D superconductors exist in nature, and single-layer NbSe2 is the first among them that remains a superconductor in its isolated, 2D form without the need of a special substrate. Furthermore, CDW order—spatial modulation of both the electron density and the atomic lattice (see figure below)—turns out to be a genuine 2D electronic phenomenon in NbSe2. This work has been recently reported in Nature Physics. Many-body interactions in solids are at the core of stunning collective electronic phenomena such as CDW order and superconductivity, which are found to exist in some TMD metals in their 3D bulk form. In reduced dimensions, materials usually exhibit remarkable differences in their properties with respect to their 3D bulk counterparts due to quantum confinement effects. In bulk NbSe2 a CDW sets in at TCDW = 33 K and superconductivity sets in at Tc = 7.2 K. Below 7.2 K these electronic states coexist but their microscopic formation mechanisms in bulk remain controversial after nearly four decades of intense research. Furthermore, the fate of its CDW and superconducting phases in the ultimate single-layer limit has also remained mysterious until now. Writing in Nature Physics, the team has characterized the electronic structure of a single layer of NbSe2 directly grown on graphene, which experimentally confirms that NbSe2 undergoes a reduction in the number of electronic bands involved in its collective phases (from three bands in bulk NbSe2 to just one for single-layer NbSe2). Despite significant changes in NbSe2 electronic structure upon dimensional reduction, the authors show that in stark contrast to recent theoretical predictions, the CDW phase of single-layer NbSe2 remains unaffected when the material is thinned down to the single-layer limit. 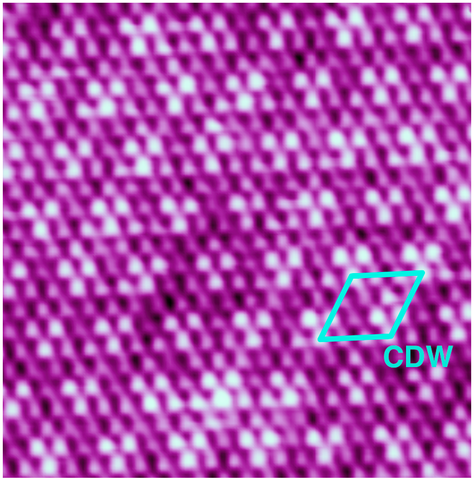 Because of the robust 2D character of the CDW in NbSe2, researchers experimentally ruled out two well-known mechanisms proposed to explain the origin of the CDW in NbSe2. On the contrary to the CDW phase, the material remains a superconductor although with a critical temperature TC = 1.9 K, a significant departure from the behavior of bulk NbSe2 (TC = 7.2 K). In summary, these results paint a clear picture of the effects of reduced dimensionality on the CDW and superconducting phases of a model strongly correlated system. This creates exciting new opportunities for directly exploring the interplay between superconductivity and other competing collective phases in 2D.